Despite its unusual unveiling at the White House, presidential endorsement, and significant media coverage, a new Senate Republican bill proposing dramatic cuts to legal permanent immigration is unlikely to gain much traction in Congress. Still, the ideas that underpin the RAISE Act seem likely to affect future immigration debates. The two major proposals in the legislation introduced by Sens. Tom Cotton of Arkansas and David Perdue of Georgia are deep cuts to family-based immigration and the creation of a points system for the selection of immigrants coming via employer sponsorship. Our analysis suggests the family-based cuts would fall hardest on U.S. residents seeking to bring in relatives from a small number of countries, with disproportionate effects for India and Vietnam, among others. And while much attention has focused on the points system and the sponsors’ promise of “merit-based” immigration, in reality the legislation would change employment-based immigration less than some might anticipate, as this analysis will explain. Source: Department of Homeland Security, 2015 Yearbook of Immigration Statistics. Slightly more than 1 million immigrants are granted lawful permanent residence (informally known as getting a green card) annually; just over half are already in the United States and adjusting from temporary status. 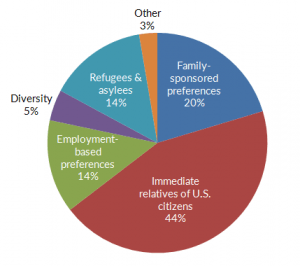 Family-based immigration comprises about two-thirds of the annual total. The RAISE Act seeks to halve this 1 million by eliminating many current categories for family-sponsored immigration. Currently, U.S. citizens can sponsor spouses, minor children, and parents without numerical limitations. Under capped categories, U.S. citizens can also sponsor adult children and siblings; and legal permanent residents (LPRs) can sponsor spouses, minor children, and adult unmarried children. The Cotton-Perdue bill would eliminate all family sponsorship beyond spouses and minor children of U.S. citizens and LPRs (reducing the age limit for minor children from 21 to 18), and would lower capped family categories from 226,000 green cards presently to 88,000. These deep cuts to family-based immigration would affect immigrants from some countries more than others. U.S. residents with relatives from Mexico, the Dominican Republic, the Philippines, China, India, and Vietnam are the most frequent sponsors of family-based green cards. And the majority of those sponsorships for all but Mexico and the Dominican Republic are for categories slated for elimination under the Senate bill—including more than 70 percent of green cards from India and Vietnam. Under the bill, those waiting in sometimes decades-long lines for family sponsorship through capped categories would lose their chance for a green card unless they could win one of the limited visas available under the points system. While the RAISE Act would end green cards for the parents of adult U.S. citizens—about 133,000 became LPRs in fiscal 2015—it would allow them to come in as temporary immigrants. But U.S. sponsors would first have to demonstrate the parents have health-care coverage and accept full responsibility for their economic support. Parents would be barred from any public benefit, even provided by a state or local government (a provision that could be expected to face legal challenge over whether the federal government can dictate state or local policy in this fashion). The RAISE Act does not increase the number of employer-sponsored green cards, which have been capped at 140,000 green cards annually since the employment-based system was created in 1990. And it continues to count spouses and minor children against the 140,000 cap, leaving roughly half of green cards for the selected workers. What the Senate bill proposes is to change the system for allocating these green cards. Under the current system, most employment based immigrants enter through five discrete channels: (1) “persons of extraordinary ability” who can document high-level accomplishments in their field, a tough standard for most workers to meet, particularly early in their careers; (2) professionals with advanced graduate degrees or exceptional ability; (3) professionals, skilled workers (those with at least a two-year college degree), and unskilled workers (for whom just 5,000 green cards are allocated yearly); (4) certain special immigrants who meet U.S. national interests; and (5) immigrant investors, who invest at least $500,000. Having been in line for an eliminated visa category (2 points). Currently, 85 percent of employment-based immigrants adjust to lawful permanent residence from a temporary worker or student visa within the United States, given the difficulty of finding an employer sponsor while abroad and strong demand by H-1B workers and their employers for permanent immigration. Under the RAISE Act’s allocation of more points for a higher-paying job offer, English skills, and a U.S.-based STEM degree, those already studying in the United States or working on an H-1B visa would remain at a strong advantage for an employment-based green card. The countries that have the most H-1B workers—India and China—and those that send the most students to the United States—China, India, Saudi Arabia, and South Korea – would thus likely dominant the points-based visas system, with some additional advantage to nationals of English-speaking countries. The points system would also potentially widen the path for employment-based entry for those without a current job offer; currently this path is open only to a small number of those with extraordinary ability. Under the proposed points system, those with a bachelor’s degree and sufficient points for other characteristics could gain entry even without an employer sponsor. This move partially away from employer sponsorship runs counter to trends in countries such as Canada and Australia that have a long history with points systems. In recent years, these countries have modified their points systems to prioritize entry of those with a job offer, after finding that not all highly skilled immigrants fare well in local labor markets. Entry through the points systems would surely be incredibly competitive, with only the most highly educated, most English fluent, highest-paid STEM workers making the cut. In 2016, 236,000 people applied for H-1B visas that are capped at 85,000 per year. And some would-be immigrants from India and China wait ten years or more for an employment-based visa. The question is: If only those scoring the most points could get in, would critical labor market gaps be filled? The RAISE Act would allow for quadrennial adjustment of the points categories and scoring by characteristic, but would not allow for flexibility to adjust the overall numbers of green cards to reflect changing economic conditions. The main lesson learned by Canada, Australia, the United Kingdom, and others that have used the points system is that flexibility and regular adjustment of selection criteria are essential for success. As a whole, the implications of the RAISE Act may be both bigger and smaller than promised by its sponsors. The proposed employment-based system changes may be smaller than anticipated, with the points structure largely echoing the existing preference for higher-educated, higher-paid workers or for investors, and for those already in the United States on a temporary basis. The elimination of per-country caps would favor nationals from India and China who already meet high-skill visa requirements but currently face long backlogs. Points for English test scores might slightly advantage workers from English-speaking countries. Overall, the points-based system may at best bring a slight upskilling in the employment-based immigration system. The changes would be far more dramatic for humanitarian and family-based immigration. On the humanitarian front, the legislation would put a statutory cap of 50,000 for annual refugee resettlement— eliminating the President’s ability to adjust refugee admissions in response to world crises and in pursuit of diplomatic and humanitarian goals. For the family-based system, halving the numbers would come at the strong price of reducing opportunities for family unity, a deeply rooted value in U.S. immigration history. And in a few ways, the bill articulates new priorities for U.S. immigration. For example, English proficiency has never been a requirement for immigration, but the points system would give strong advantage to those who already know, rather than those who are learning, English. In one striking element, the bill would add an additional criterion to qualify for U.S. citizenship. Before green-card holders could obtain citizenship, their sponsor would be required to reimburse the government for any federal means-tested benefits used during the first five years on a green card. Such an economic element has not been a feature of U.S. citizenship policy. By eliminating the diversity visa lottery, which provides green cards for those from countries that send fewer migrants to the United States, the legislation also would cut off a pathway for new, diverse immigration streams for those who do not have employer or family ties. The concepts advanced in the RAISE Act and the philosophy undergirding it would represent dramatic changes to current immigration policy and to long-held American precepts about the value of immigration.